Who: Melissa de la Fuente, desiger of the lovely Acts of Kindness jewelry line, weekly contributor at Creature Comforts and a special friend whom I met through this crazy world of blogging. Once a week, husband says 2x week! :) He is probably right! So, 8-12 items a month Not all for me of course! Truly! Well, the first thing that made me buy it was it's looks! It was love at first sight! Then, I liked it's size and price. I thought it was a good price and something I could swing as I needed a new purse. I actually just bought the red Drika weekender....and now i see that she put an orange one up for sale!!! Melissa looks happy with her new purchase--and I don't blame her! 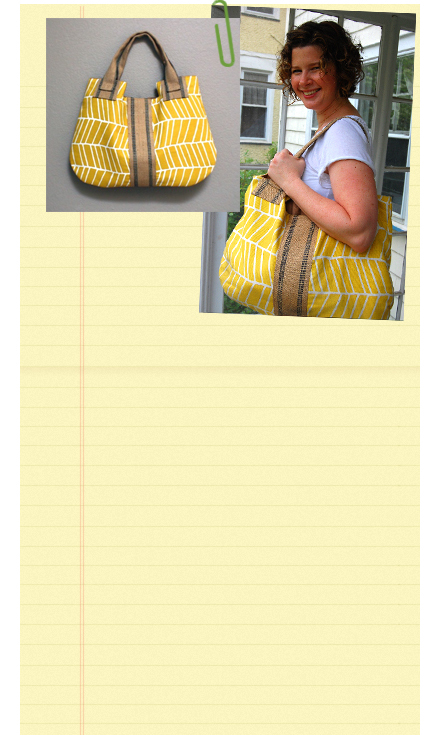 I've been coveting a drikab bag myself. Oh, good for you Karen! You will not be disappointed, it is a SWEET bag! I am having fun Kai! ;) Thanks for this super fun feature Marichelle! karen, so excited to see your bag! this bag honestly haunts me...everywhere I turn it is there! It is destined to be mine!